The Vivo Y81i comes with a large bezel-less display having a notch on top. Hence the visual it can provide would be promising. The camera and the battery performance are also up to the mark. The processor, however, is not too strong to handle high-end games. Considering the budget, it could have been better. 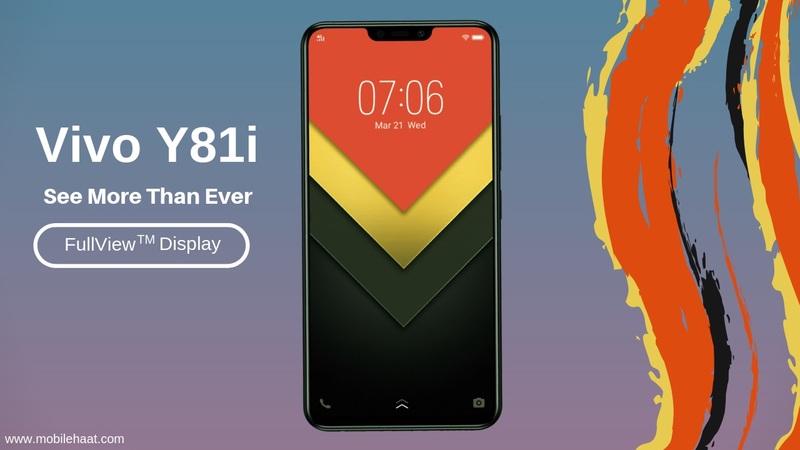 The Vivo Y81i comes with a tall bezel-less 6.22-inch IPS LCD display having a resolution of 720 x 1520 pixels and a density of 270 PPI that can provide a great viewing experience. Under the hood, it has a quad-core Cortex A53 processor having a clock speed of 2GHz which is seated upon the MediaTek Helio A22 chipset. There is a PowerVR GE8300 GPU and a 2GB RAM that can provide a lag-free performance. The device has been provided by the 13MP rear camera that can capture clear pictures. It has the front lens of 5MP which can impress the selfie lovers. To power the device, it has a massive 3,260mAh Li-ion battery that can provide power for a long time. The smartphone has an inbuilt storage of 16GB which is decent. There is an external memory slot that can be expanded up to a massive 256GB, which ensure there would be no issues with the storage space. For the connectivity, it has the 4G VoLTE, Wi-Fi 802.11, Mobile Hotspot, Bluetooth, GPS with A-GPS, Glonass, micro USB 2.0, etc. Operating System: Android Oreo v8.1 on Funtouch OS 4.0. Graphics Processing Unite (GPU): PowerVR GE8300. Body: 75 x 155 x 7.77 millimeter. Weight: 146 grams (Plastic body). SIM Card Type: Dual SIM, (Nano-SIM, dual stand-by). Sensors: Accelerometer, proximity, compass, ambient light. Display Protection: IPS LCD Full-View screen. Camera Factors (Back): Autofocus, auto face recognition, LED flash, HDR, bokeh, portrait mode, panorama. Camera Resolution (Front): 5 Megapixel. Memory Card Slot: MicroSD, up to a massive 256 GB. Battery Type & Performance: Li-ion 3260 mAh, non-removable. MP3, MP4, FM Radio, Loudspeaker.